A special place where disabled animals enjoy life. Tanner is one of those dogs who likes to gather his toys around him and keep them with him wherever he goes. So usually you’ll see him on a bed, happily chewing on a toy while surrounded by another three or four toys … just in case. We joke he’s?a toy hoarder. But this was the first time we’d seen him start taking toys up the stairs and depositing them along the way. 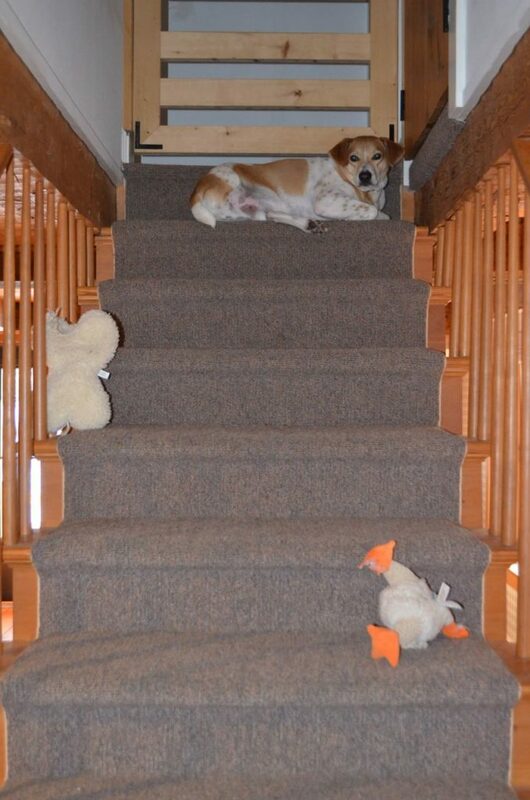 I’m not even sure why he didn’t have a toy with him at the top — he might have been taking a break, in between dashing back down the steps’to his toy stash in the living room and returning with another one. Maybe it’s bait. Leaving them seemingly “unattended” for another dog to be tempted, and then Tanner gets the fun of the chase if another dog tries to carry one off? I’ve got a dog who does just that. But who knows what Tanner is up to. For sure that handsome gentleman has a master plan. I have a hoarder too! Reilly likes to have all her toys on the landing and if one rolls off, she brings it back. They’re her babies, we think, so we think the wants to have all of them under her careful watch! Some of us have comfort foods we can’t do without. Tanner has comfort toys. You never know when someone might come along and take it or maybe a wind blow it away so backups make sense in Tanner World. Very cute! Maybe it’s a new way of showing off his booty. He’s at the top, surveying his wealth and displaying it to passersby. Tanner! Go get that birdy. C’mon, get the birdy! Tanner is adorable! I have one dog that does this with balls. Unfortunately, he sometimes hides a bunch of them under my blankets. Maybe the toys had been at the top. He was too tired to retrieve them?? To keep up with our disabled dogs, check out our blog! Click here. Our Winter/Holiday 2018 print newsletter is now in the mail. You can read it online here. See videos of our disabled animals on our YouTube channel here.